Many in labor believe that California Proposition 32 would be a near fatal blow to the California labor movement. On the grounds that “special interests have too much power over government,” conservative attorneys wrote California Proposition 32 to ban direct contributions to California candidates by corporations and labor unions. It prohibits the collection of “political funds” from corporate employees and union members via payroll deduction, even if the employee or member voluntarily approves. Political funds include money spent for or against a candidate or ballot measure or for a party or political action committee, or PAC. The proposition prohibits corporations and unions from using payroll deductions for political purposes, but of course corporations don’t use payroll deductions; they use their profits. So, corporate donations would not be banned. Only unions would be affected by this ban. It is a political bait and switch. The proposition pretends to ban political contributions from both corporations and labor, and then they exempted the corporations. Steve Smith of state AFL-CIO claims that dark money groups including the Koch brothers and Karl Rove have donated millions to pass Proposition 32. The American Future Fund (AFF), a front group for corporate special interests that’s linked to the Kochs, dropped $4 million to the effort to pass Prop 32. 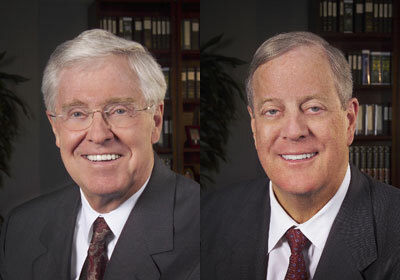 American Future Fund is an Iowa-based “advocacy organization” backed primarily by oil interests and directly linked to billionaire oil tycoons Charles and David Koch. As a 501(c)(4) organization, AFF does not disclose its donors and can receive unlimited contributions. Like the battle for Wisconsin last year, Prop.32 in California is a part of a sustained anti union effort on the part of right wing extremist forces well funded by U.S. billionaires. Bill Fletcher in his fine book, “They’re Bankrupting Us” and 20 other Myths about Unions, (2012) traces this major assault on unions back to the 1980’s and the Ronald Reagan presidency. It is worth noting that Ronald Reagan was governor of California from 1968-1976, Reagan crafted and fashioned his assault on labor through his campaign against the United Farm Workers and in favor of the grape growers. The tools of the assault, and the ideological battles were developed and tested against the UFW before Reagan became a viable candidate for the Presidency. Now, with Proposition 32 we are back to California to further decimate labor’s political participation. You can contribute to the campaign for No on 32. here. 67 page Romney propaganda/voting order doc to his 12,000 employees. result, of Steve Wynn’s bullying attempt at voter intimidation. DUMB”. He would be ‘smart’ to do a fundraiser for Obama. selfish, greedy and anti-humanity..and they will get it. Steve Wynn depends upon people’s good will. He just lost it. If Obama wins or loses Wynn still loses. are more important than American Insurance Company Shareholder profits.